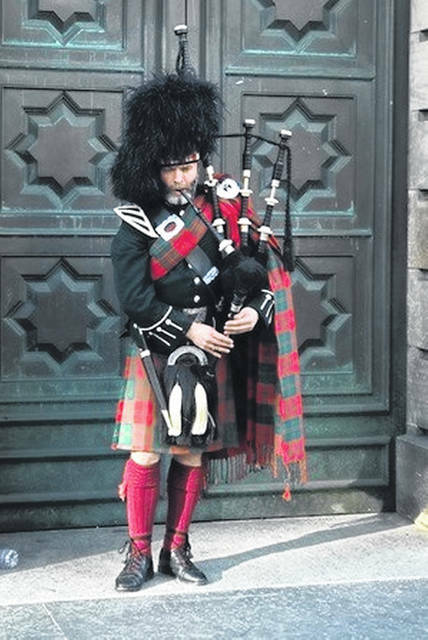 A piper calls the faithful to the kirk, or church, in Edinburgh, Scotland. WILMINGTON — The Presbyterian Church of Wilmington will celebrate our Scottish heritage with the Kirkin’ of the Tartan, a Scottish-American custom, at a 10 a.m. service this Sunday, Oct. 21. Originally, the Kirkin’ was considered a re-dedication of clans and others to God’s service. In the 18th century, Scots had to hide their ancient Scottish clan tartans in the Kirk. In 1745, Prince Charles Edward Stewart, “Bonnie Prince Charlie,” returned from exile in France and landed in Scotland, where he began to enlist the Highland Clans for an unsuccessful attempt to dethrone George II of England and to restore the Scottish throne to the Royal House of Stewart. When Charles was defeated, the Scottish Highlanders were banned from the wearing of any sign of the tartan, forbidden to speak in Gaelic, and music, dancing, or the playing of the pipes was outlawed. As an act of defiance, the Scottish Highlanders would touch the hidden piece of tartan cloth under their clothes when the minister gave the benediction, or kirkin’, thus rededicating themselves to God and their Scottish heritage. The custom was brought to America with Scottish settlers before the Revolutionary War and revived most recently by Rev. Peter Marshall, Chaplain of the Senate in the 1940s and 1950s to instill pride among Scottish-Americans in their Scottish homeland. The ceremony is now held in many Presbyterian churches across the US. So, this Sunday, the pipes will ring out across Timber Glen as we call the clans to our Kirk in a celebration of the Scottish heritage of the Presbyterian Church. We hope that all of our members and friends will join us. Kilts are optional, scones will be served and the Lord will be praised.